Me being productive on set! I’m sure we all have our own little secrets about how we stay active and productive in this very stressful world. In this post, you will find a list of helpful applications, activities, and tidbits about how I personally keep myself sane throughout my graduate studies. I’ll start my list with the practical answers, the things that actually make attending film school possible, followed by my more personal choices, the things that keep me functioning at my highest capabilities in the midst of school and personal life. So keep reading to find out my little secrets! As filmmakers, we’ve all had the discussion of whether or not to purchase Final Draft when there are other, less expensive options on the market. Through my experience with screenwriting (I’ve used Microsoft Word and Celtx), I have never had a user-friendlier interface than with Final Draft. SmartType predicts what you will be writing next, so it keeps you in dialogue when writing dialogue, and it can predict which character will be speaking next. It can also anticipate when you are starting a new scene, among countless other things. I also love the revision mode, which marks any changes with asterisks after you enter into locked script. 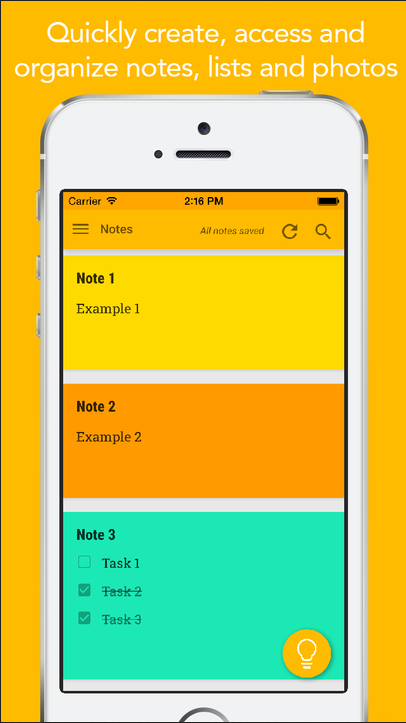 It also keeps your revisions categorized by color to keep yourself and other department heads organized. As a student, the price is only $99, and that guarantees a lifetime of updates. It’s worth the price, and it’s worth the sanity. 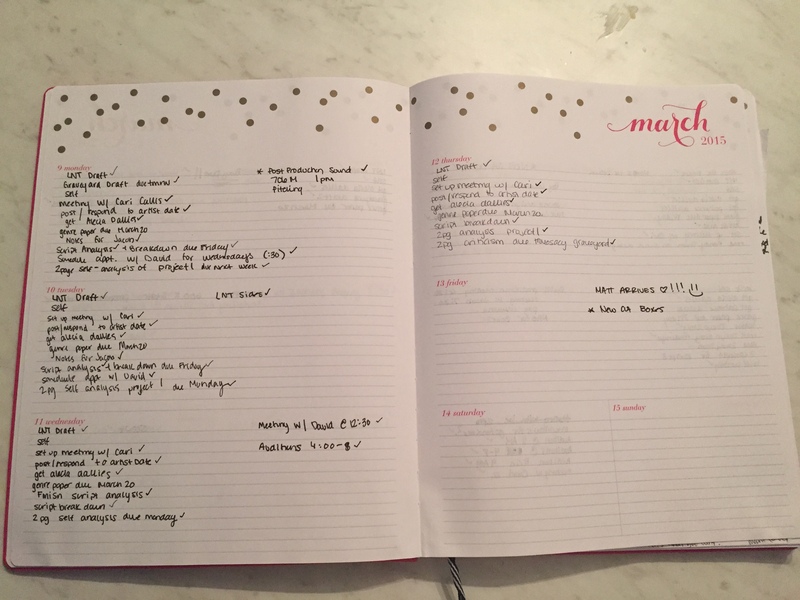 Who doesn’t love keeping lists? It is actually an obsession of mine. The most satisfying part of any day is when I get to cross of an item on my list. Not only do I feel satisfied, but also I know that I am moving closer to completing a larger goal. With Google’s convenient list keeping application, GoKeep, you can keep lists in an organized, digital, and aesthetically pleasing fashion. Not to mention, GoKeep is connected to your gmail account, so you can share lists with friends, family, and, better still, your producers! This means you can share a list with someone and update the list together whenever goals are accomplished. The color coordinating is also helpful to keep productions separated from, say, your shopping list. The application is available on your phone, and can also be accessed through your internet browser. I’m sure we are all familiar with Skype, but I’m sure you wondering why I find it crucial to my productivity. 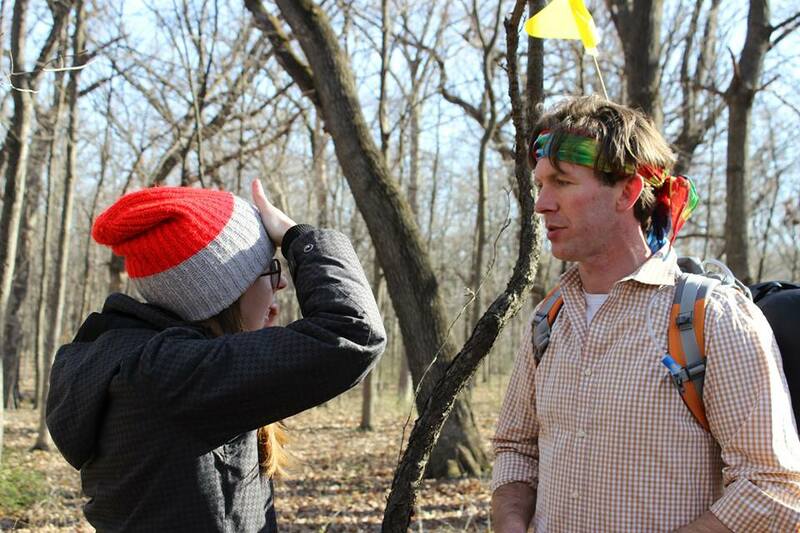 Filmmaking is a 24-hour a day, 7 day a week profession. That means, you never really are off the clock. When I am home for the night, after a long day of classes and work, and I realize that I need to talk with my producer about a script that is due in 10 hours, Skype is my best friend. Living in a city severely limits your timely mobility. Instead of trekking across town at 11pm, it is much more convenient to have Skype calls. These calls can last anywhere from 10 minutes to 3 hours, but they are crucial for staying on schedule, and also keeping both myself and whoever I am Skyping with, comfortable. The beauty of Skype is that you can work from home! One thing I learned from a producer friend of mine is that organization will save the day in filmmaking. My email account used to be out of control, with thousands of emails backed up, with me deleting and saving emails without rhyme or reason. 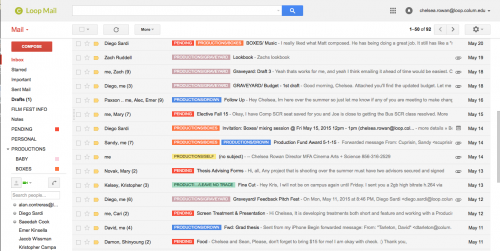 After my friend showed me how to keep my gmail account organized, I have saved a lot of time and effort trying to remember who I need to email back and where I put emails after I read them. 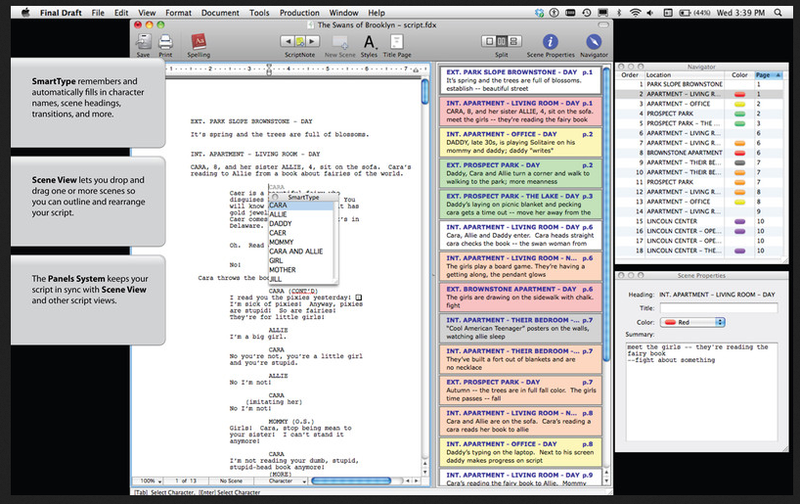 As you can see from the image above, all productions are color-coded. Emails that I need to respond to are marked in a bright red PENDING. I also color code all emails related to class, work, and financial aid. 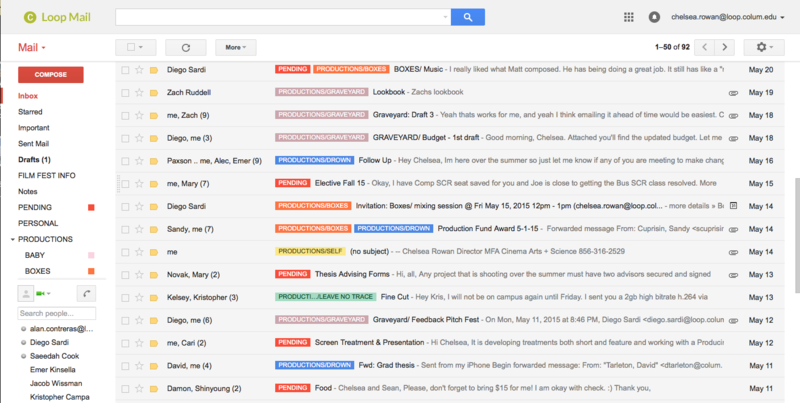 I never have more than 100 emails in my inbox at any time, and that is usually only during production times. 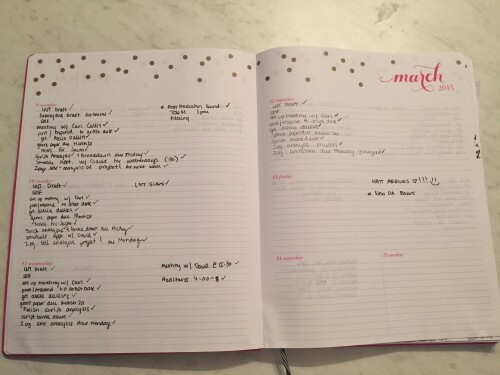 Staying organized helps me relax, which helps me stay on track and to meet my deadlines. I can’t say it enough, but spend the money on a good, sturdy planner, and USE it. Planners are like lists. They help to remind you of all the things you need to do, and also keep track of any and all meetings you have coming up. There is also something cathartic about writing things down, in pen, on a piece of paper, which helps me to blow off steam. Also crossing off finished assignments makes me feel all the more accomplished. Not to mention, all my previous tips have been digital. It is important to break away from the digital world whenever possible. It helps the eyes, the brain, and our overall creativity. While I don’t have all the time in the world to read when I would like to, I think it is very important to have hobbies outside of filmmaking that are still creative and engaging. Reading is my hobby. Reading fuels me whenever I feel like I am running on empty. 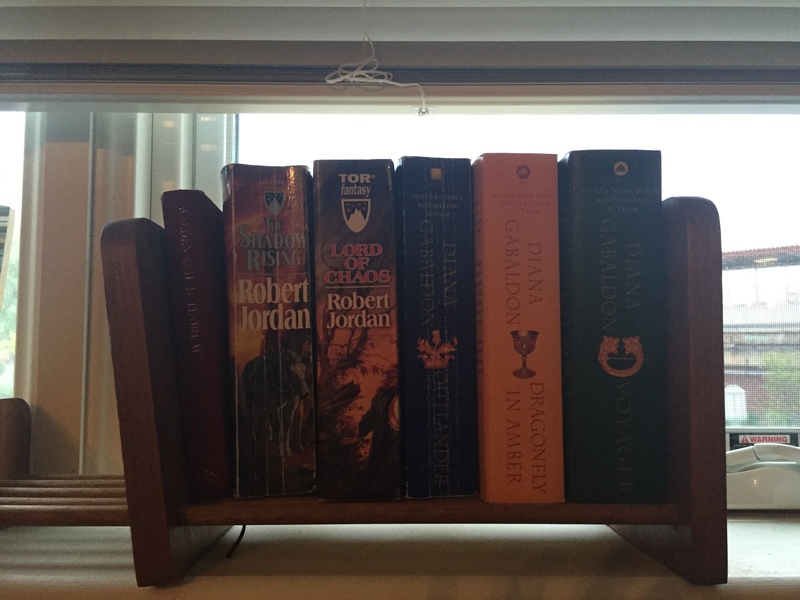 I also don’t find it daunting to have more than one book waiting to be read. In fact, it excites me knowing there are books waiting for me to pick them up. One of my screenwriting professors made it clear to us that it is important to have artists dates, which are days and activities that inspire us in our personal life, which will eventually translate into our filmmaking. For me, I read. I read on the train to and from school. I read in the mornings with a cup of tea. I read when I can’t finish that script that has been bothering me. If reading isn’t your thing, then find something that is! Writing (not scripts), drawing, exercising, cooking, anything! The point of this blog post was the shed light on some of my personal methods of keeping myself sane throughout graduate studies. All of the tools listed above help keep me on a path towards my own personal success. I hope this has helped even just one person in finding productivity in their own lives.